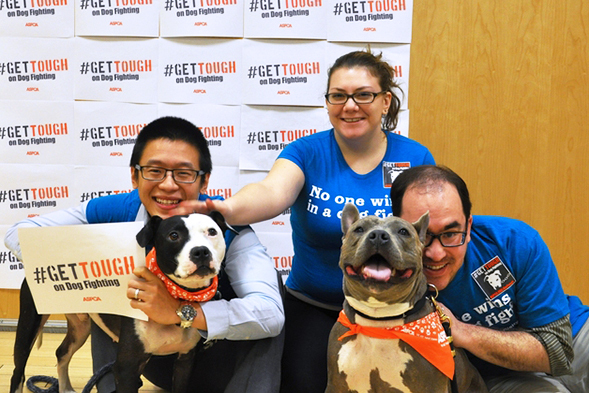 We're Celebrating National Dog Fighting Awareness Day—and You Can, Too! Wednesday, April 8, marks the ASPCA’s second annual National Dog Fighting Awareness Day (NDFAD), and this year we are working harder than ever to spread awareness about this brutal form of animal cruelty. Read on to see how ASPCA staffers and supporters are lending their voice to this important cause, and find out how you can get involved, too! 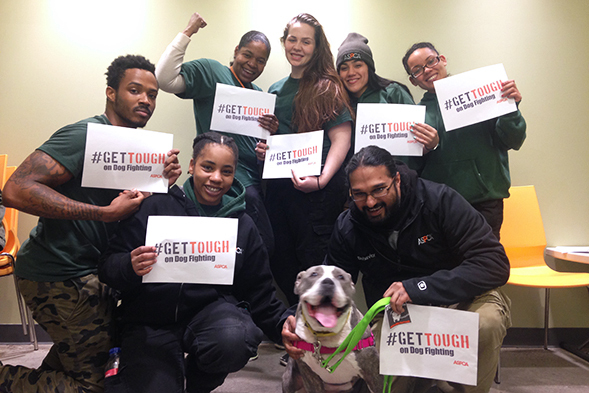 At the ASPCA offices in New York City, staff members vowed to “Get Tough” on dog fighting by posing for photos with pit bulls and sharing them on social media using the hashtag #GetTough. Misty, right, was a former bait dog used in dog fighting. Today, she is a beloved family pet. Professional wrestler AJ Lee joined in the action by opening up about the five fighting dogs her family rescued over the years. She also participated in our #GetTough campaign—and thousands of people shared her tweets to help spread the word. Get Tough. To join our #GetTough movement, simply take a selfie with one of our free, downloadable #GetTough posters and sharables, then post it to social media using the hashtag #GetTough. Take Action. Sign our petition to tell the Department of Justice (DoJ) that you want to see more federal dog fighting prosecutions. Donate. Support our work to defeat dog fighting by making a gift to the ASPCA today. Animals around the country are counting on your compassion, your outrage and your willingness to stop their suffering. By taking one (or more!) of the actions listed above, you’ll be joining a growing group of animal-lovers who are dedicated to putting an end to this nightmare. Thank you for your voice!